Communication is very important to an Extreme Programming (XP) team. You can add vital communication paths to your team by just taking down the barriers that divide people. Putting computers in a central area that no one owns makes pair programming easier and encourages people to work together with feelings of equal value and contributions. 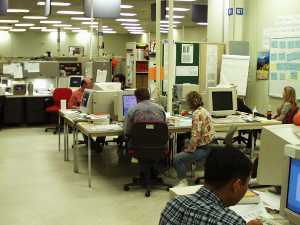 Putting a few desks around the perimeter gives people a place to work alone without becoming disconnected from the rest of the team. 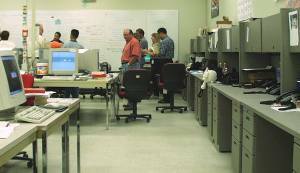 Including a large area for daily stand up meetings keeps people from missing the meeting. Adding a conference table gives you a home for group discussions that occur spontaneously throughout the day. Being able to see the discussions encourages people to listen in or join the discussion when they have a stake in the out come. Adding white boards for design sketches and important notes or blank walls where user story cards can be taped adds even more channels for communication. Posting a couple large charts targeting process improvement or project progress informs the team without management hounding them about progress.